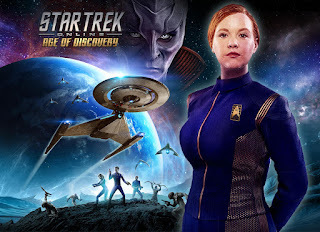 Last fall, in what seems like the heels of the "Victory is Life" expansion some new content dropped on STO, titled "Age of Discovery" which seems to be content for the game that runs concurrent with the show that started yesterday evening, and perhaps with the on-going IDW series on Star Trek Discovery. 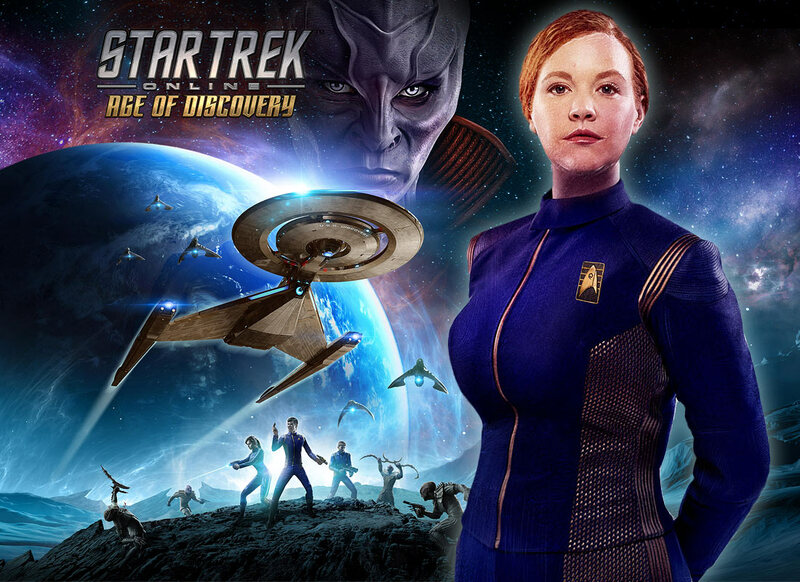 With this new content you start off as a cadet in the Discovery era of Star Trek (10 years before TOS). This particular mini-expansion doesn't have the usual hallmarks of expansions, such as temporal beacons, completing missions for account-wide rewards and so on. It also seems like the content for this expansion will be released periodically over 2019 in conjunction with the show; and perhaps when the show concludes in the spring we'll come back to the Victory is Life story-arc. Another thing that changed was that Random queues where introduced, and counters (for how many people were queued up for something specific disappeared). Many seem to have hated this, but in all honesty I can finally find people to play the Khitomer Accords with. After 7 years playing I finally was able to get the Quadra Service Medal (play a Khitomer Accords mission 100 times). Yes, lots of grinding, but it goes MUCH faster when people actually queue up for these things. 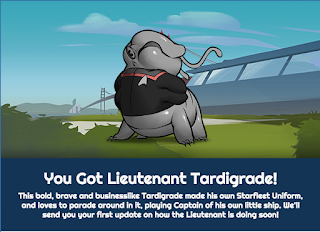 Finally, something fun before the end of 2018 - After you completed a silly little quiz on the STO website (sort of like those web-based personality quizzes from the late 90s) you got matched up with a specific Tardigrade. 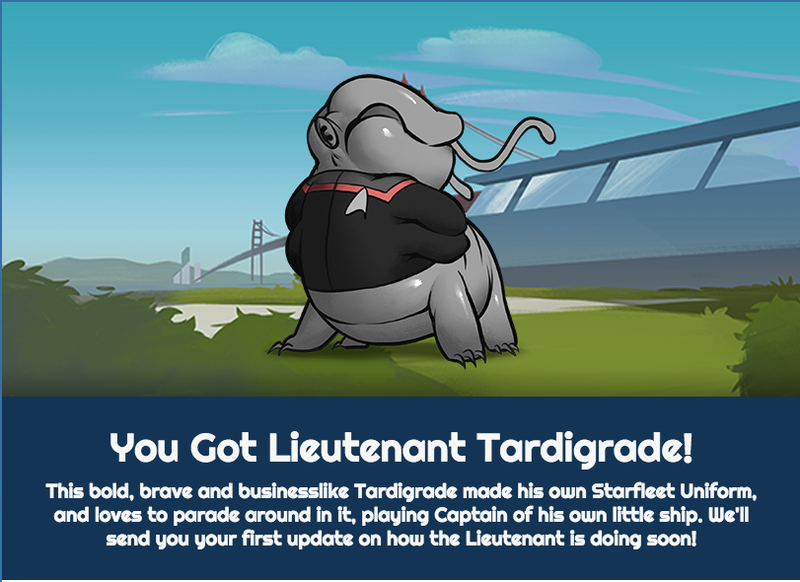 I got Lieutenant Tardigrate (as opposed to Party Tardigrade or Scientist Tardigrate). Cryptic said they would send periodic updates about these via email. I wonder how long they'll keep it up. The first email: Folks, I don't know that I've ever seen a Tardigrade as happy as the Lieutenant when he saw his new uniform for the first time. I've heard these magnificent creatures vocalize several times, but never quite so high pitched of a....well, squeak is the best way to describe it. It was nearly impossible to hold him still to get the uniform on, but once it was on the Lieutenant was the absolute picture of calm, standing at perfect attention and scanning the room. We think we may need to get his enclosure some more decorations.